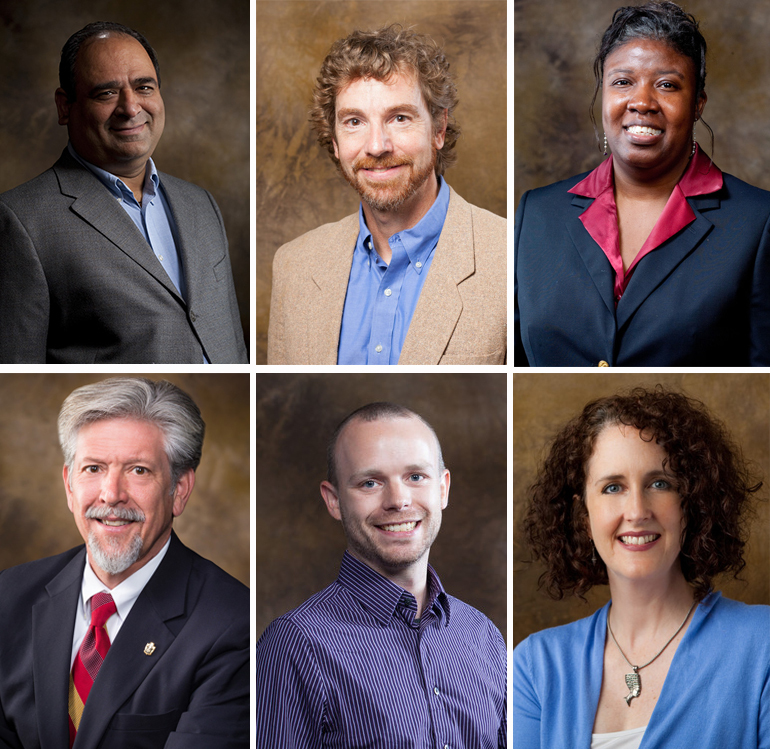 Top row: Vikas Anand, Mack Ivey and Claretha Hughes; lower row: Curt Rom, Timothy Muldoon and Laura Terry. FAYETTEVILLE, Ark. — The Honors College will recognize six exceptional faculty members at the annual Honors College Faculty Reception, from 5-7 p.m. Thursday, Nov. 5, at the Janelle Y. Hembree Alumni House. All faculty members on campus are encouraged to attend and celebrate the award winners. Each award winner will receive a bronze medallion sculpted by honors alumnus Hank Kaminsky, as well as $1,000 to support undergraduate research. Vikas Anand, professor of management, faculty director of Master of Business Administration programs and executive director of strategic planning and innovation in the Sam M. Walton College of Business. Anand’s research focuses on corruption and ethics in organizations, crisis management, organizational identity and information management. He has empowered his honors students to develop their own group assignments, and they have responded by developing materials such as a video primer for international students new to the U.S. and a training manual for companies readying expats to move to Asia. He led a globalization class that included students in India, taught in real time, and has taken students to India seven times to study management practices there. As the director of Walton College’s M.B.A. program, Anand has mentored more than 30 honors students involved in the accelerated M.B.A. program, and he has included honors undergraduates in graduate courses that partner students with local companies. He has directed more than a dozen honors student theses. Anand has won a number of teaching awards, with the most recent being the Associated Student Government Teacher of the Year award (2011), the Walton College Best All Around Faculty Award (2012), and the Beta Gamma Sigma Award for Teaching Excellence (2013). He is a member of the U of A Teaching Academy. Mack Ivey, associate professor and vice-chair of biological sciences, J. William Fulbright College of Arts and Sciences. Ivey’s research focuses on microorganisms living in extreme environments and the disease mechanisms of the human pathogen Clostridium difficile. He has mentored more than 30 honors theses, including two titles that were selected for publication in Inquiry: The University of Arkansas Undergraduate Research Journal. Thirteen of his students have received Statewide Undergraduate Research Fellowships. Ivey has served as honors adviser for the Department of Biological Sciences for over a decade and has been a member of the Fulbright College honors council. He has received six Outstanding Mentor Awards from the Office of Nationally Competitive Awards, and has been recognized with the Associated Student Government Teacher of the Year Award (2009), the Fulbright College Outstanding Advisor Award (2011), and was a finalist for the Imhoff Award for Outstanding Teaching and Student Mentorship (2010). Timothy Muldoon, assistant professor of biomedical engineering, College of Engineering. Muldoon’s research centers on the development of advanced optical imaging and spectroscopy tools to improve detection and clinical management of human disease, with particular emphasis placed on endoscopic imaging tools that improve detection and clinical management in gastrointestinal cancers. Another major research project is the development of a low-cost blood cell analyzer system, capable of providing important information to patients and clinicians in demanding environments within minutes. In each of these projects, undergraduates work alongside graduate research assistants extensively, and four honors students have participated in peer-reviewed publications coming from these works. Muldoon has mentored seven honors students since the biomedical engineering department was created in 2012. He serves as departmental honors coordinator, organizing an end-of-year, conference-style research symposium that gives each student a forum in which to present their work. Muldoon previously received Outstanding Teaching (2013) and Outstanding Service (2015) awards from the Department of Biomedical Engineering. Laura Terry, associate professor of architecture, Fay Jones School of Architecture and Design. Southern culture is at the heart of Terry’s research, painting and teaching. Her paintings, which she has exhibited in Savannah, Atlanta, Minneapolis, Los Angeles and New York, celebrate the Southern landscape and its rich tradition of porches, agrarian ruins and food. With all teaching endeavors, Terry encourages students to see beyond what is easily seen and to capture the extraordinary from the ordinary landscape around them. She has directed five honors student theses on topics ranging from a spatial analysis of Alwin Nickolais’ choreographic works to the production of a 12 ½-foot-wide by 6 ½-foot-high abstract drawing that pushes the boundaries between 2-D and 3-D space. One of Terry’s students published his honors thesis in Inquiry, and others have received SURF and Honors College research grant support. Terry has served on numerous honors theses committees across disciplines and colleges, and regularly participates in Honors College grant reviews and fellowship interviews. Terry previously received the Department of Architecture McIntosh Faculty Award (2003), the Tau Sigma Delta Silver Medal (2005) and an Office of Nationally Competitive Awards Outstanding Mentor Award (2008). Claretha Hughes, associate professor of human resource and workforce development, College of Education and Health Professions. Claretha Hughes did much to expand and enrich the honors experience in the College of Education and Health Professions during her 2011-15 tenure as director of the college’s honors program. The numbers tell the story: student participation in honors grew almost 60 percent. The number of honors graduates nearly tripled, and the number of students who received Honors College grants grew five fold. Hughes restructured the college’s Honors Council and developed the annual Honors Research Symposium and Workshop and a handbook for college honors faculty, among other initiatives. She also promoted social events such as an annual honors tailgating party and a luncheon for graduating honors seniors and their families. Hughes’ research focuses on creating value through human resource and technology development. Her 2012 book, Valuing People and Technology in the Workplace, received the R. Wayne Pace Book of the Year Award from the Academy of Human Resource Development. She is the 2009 University Council of Workforce and Human Resource Education Outstanding Assistant Professor. Curt Rom, associate dean for international education, Graduate School and International Education and University Professor of Horticulture, Dale Bumpers College of Agricultural, Food and Life Sciences. Rom has long been actively involved in honors education at the university and led the Honors College as interim dean from 2014-15. As director of the honors program in Bumpers College from 2011-15, Rom worked to expand honors course offerings, created an honors student board, and launched the “Food for Thought” campus lecture series. He introduced an outstanding honors thesis competition, an undergraduate research grant program and a reception to recognize honors graduates. Rom has mentored six honors students on projects ranging from the establishment of a campus community garden to organic orchard management, and has taught honors courses on horticulture, scientific reasoning and methods, and international agriculture. He also led study tours to Scotland, Great Britain, Italy, Belgium and China. Rom’s current research focuses on farm production for local markets and sustainable and organic production of fruit crops. Rom has received numerous teaching awards, including, most recently, the Office of Nationally Competitive Awards Gold Medal Faculty Mentor (2012) and the Associated Student Government Outstanding Faculty Member Award (2013). He is a member of the U of A Teaching Academy. Rom is the proud father of two honors students, Zoë and Clio. About the Honors College: The University of Arkansas Honors College was established in 2002 and unites the university’s top undergraduate students and professors in a learning environment characterized by discovery, creativity and service. Each year the Honors College awards up to 90 freshman fellowships that provide $70,000 over four years, and more than $1 million in undergraduate research and study abroad grants. The Honors College is nationally recognized for the high caliber of students it admits and graduates. Honors students enjoy small, in-depth classes, and programs are offered in all disciplines, tailored to students’ academic interests, with interdisciplinary collaborations encouraged. One hundred percent of Honors College graduates have engaged in mentored research.